There are several ways of skinning the proverbial digital rabbit and turning it into a tasty analogue stew. The most popular one is to use a chipset from one of a small number of large-scale manufacturers; this has the advantage of low cost and relatively straightforward design, plus you also get the latest sample rates and built-in oversampling, whether you wan them or not. This approach can be found in products across the board from mobile phones to DACs costing tens of thousands of pounds. One alternative is to build a ladder DAC using discreet components in an R2R arrangement; this requires considerably more RnD and thus money but does offer greater flexibility in the design with the option to put in as much or little oversampling, filtering, etc. as the maker wants. The ladder DAC is the exclusive domain of high-end products because it’s traditionally too expensive for anything else. Moreover, the quality of the performance depends entirely on implementation. It is often assumed that ladder DACs must be better because they are made up of discrete components that can be selected for sound quality but there are plenty of examples of great sounding chip-based D/A converters on the market. There is clearly space for both approaches but it’s hard to resist the appeal of the electronic craftsmanship that goes into the hand-built approach of R2R. Aqua is an Italian company that favours the ladder DAC and builds a small range of converters that are chock full of circuitry; they also make a CD transport that can be linked using a proprietary I2S connection for minimum degradation between components. 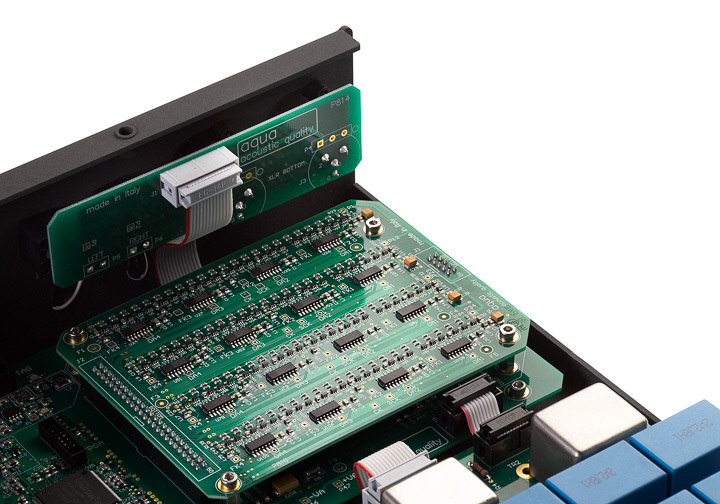 La Scala is in the middle of Aqua’s converter range and features the Optologic R2R ladder DAC, a custom-programmed FPGA processor galvanically and magnetically isolated by an optical interface between processor and convertor. Aqua (‘Acoustic QUAlity’) eschews oversampling and digital filtering and builds discrete power supplies for the analogue and digital sections using MOSFETs, JFETs, and high-speed diodes. It also incorporates a hybrid output stage into this converter certain parts of which are visible through the slot on the right-hand side of the facia. There you can see a pair of double triode valves that are followed by MOSFETs to provide a low impedance output from the single ended and transformer balanced connections on the back of the case. The front of this attractive box has a bit of Italian style in its design and the minimum of controls to play with. There is, for instance, no volume control on La Scala; it provides a fixed line output in the classic style. It has input and on/off switching and the only luxury is a phase switch in the slot next to the valves. The back panel is therefore not a lot more complicated with the analogue outputs alongside S/PDIF and AES/EBU inputs and a USB connection in a Neutrik socket, although you don’t need a Neutrik termination to connect to it. There is one outsider in the form of the I2S link on an RJ45 connection, again in a Neutrik socket, which is to support the proprietary link to Aqua’s La Diva transport; it’s not clear if it can be used with anyone else’s I2S link. There’s clearly room for a bit of standardisation on this front, companies have been putting in I2S links like this for years now but because there’s no standard, there is no known I2S compatibility across brands. It’s time that someone (maybe the AES) came up with one.